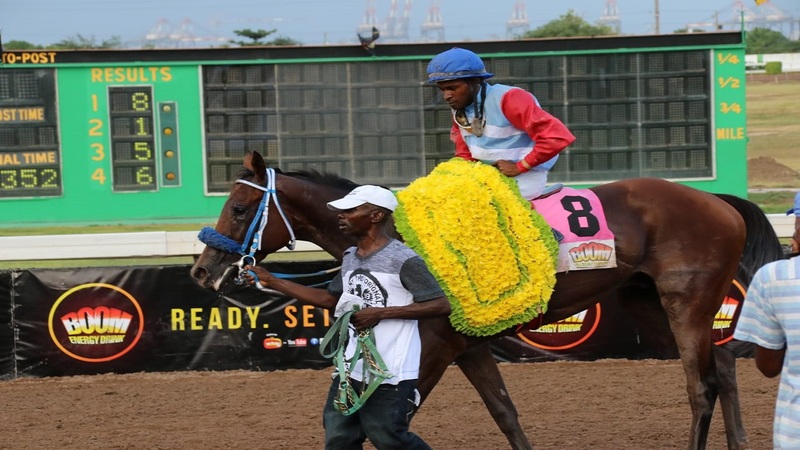 Drone Strike, with jockey Aaron Chatrie, is being led to the winners' enclosure after the three-year-old bay gelding scored a 24-1 upset victory in the Jamaica Derby over 2400 metres at Caymanas Park on Saturday. (PHOTO: Llewellyn Wynter). 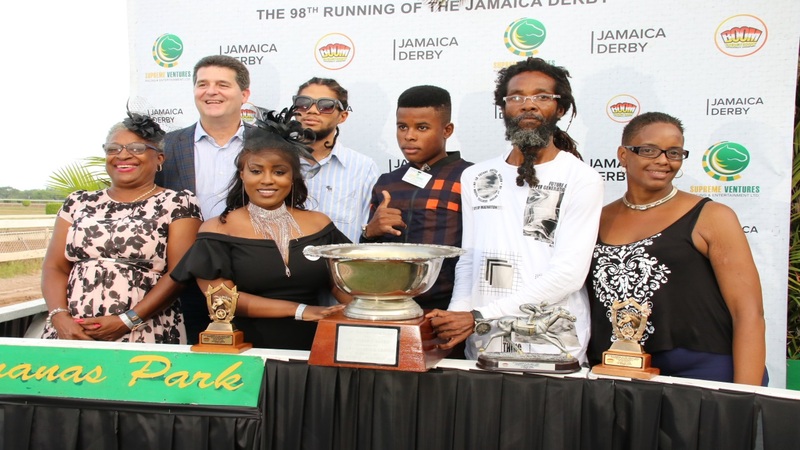 Trainer Patrick Lynch's DRONE STRIKE pulled off a stunning 24-1 upset in Saturday's Jamaica Derby over 2400 metres at Caymanas Park. Ridden by jockey Aaron Chatrie, DRONE STRIKE went in chase of 2-1 second-favourite MARQUESAS a half-mile out and got the rail into the straight. "When I saw him that close to the leaders, I knew he would kick again," said Lynch, after DRONE STRIKE stayed on strongly to beat MARQUESAS by two and three quarter lengths. Anthony Nunes' filly, FAYROUZ, the 8-5 favourite, finished a distance behind, 28 lengths, to claim third place ahead of 79-1 outsider, SON SON. The day's co-feature, the 1800-metre Viceroy Trophy, was also won by a 24-1 upsetter, Nunes' HOUDINI'S MAGIC, who made all under Wesley Henry. Nunes was the top derby day trainer with two winners, HOUDINI'S MAGIC and DANOS LA PAZ in the fifth, one of two winning favourites on the 12-race card. Non-claiming apprentice Jerome Innis booted home two winners, 16-1 shot TOUGH COOKIE in the fourth and DON'T BLUSH BABE at 6-1 in the sixth. 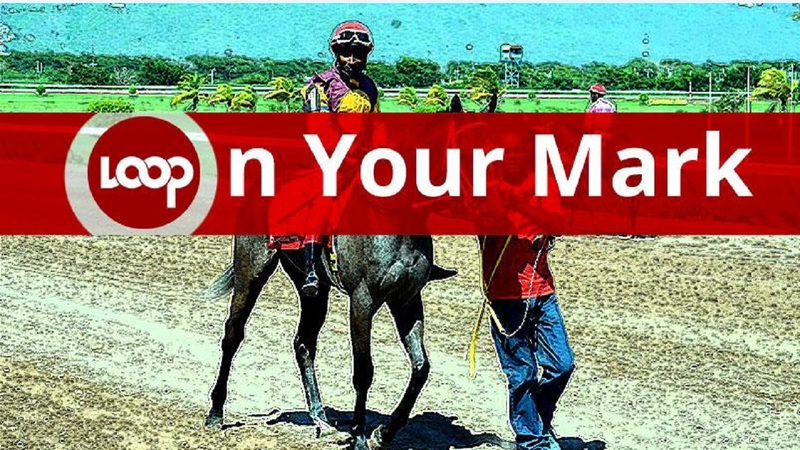 Racing continues at Caymanas Park this weekend with back-to-back meets, Saturday and Sunday.